And it's Pennzoil behind the wheel. 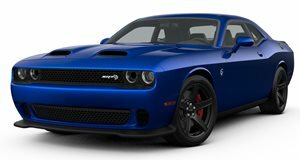 It doesn't take a whole lot of brains to know the Dodge Challenger SRT Hellcat is beyond awesome, especially when it's running on Pennzoil® Synthetics. This is how 707 horsepower is being used to its max, and it's never more evident in the video you're about to see. Have you ever heard of an Airlift Drift? Probably not, until now. This is how Pennzoil takes a Challenger Hellcat to a whole new level. Like literally. Watch as this Hellcat performs what seems to be the impossible. Making the switch to Pennzoil® Synthetics is without question the best way to take performance to a whole new level. Now stop wasting time and check out this amazing video!